Microsoft Bookings integrates with Facebook to make it easy for your customers to schedule appointments with you from your Facebook business page. 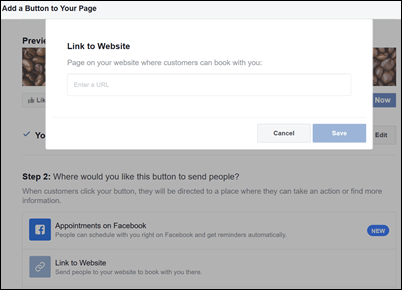 This article explains how you can direct customers to your Microsoft Bookings page by adding a Book Now button to your Facebook business page. Watch this video or follow the steps below to add the Book now button to your Facebook page. From your Booking page, copy the URL under Share your page. On your Facebook business page, choose Add a Button. Choose Book Now and select Next. Choose Link to Website and paste in your Booking page URL. Select Finish. Now you’re all set to receive Bookings through your Facebook page!